The selected candidates will get 15700 - 50000 / - from the organization. Selection will be done in accordance with written test, oral test. Interested and qualified candidates can download the website from aavinmilk.com in prescribed form and send their application on or before 10-09-2018. The prescribed format with photocopy of all relevant documents should be submitted to the address specified below. "General Manager, Dindigul District Cooperative Milk Producers Association Limited, No. 9, East Govindapuram, Dindigul - 624 001." Recruitment of AAVIN in 2018: Tamil Nadu Co-operative Milk Producers’ Federation Ltd has released the official release of the 275 Senior Factory Assistant job vacancies. Eligible and trained candidates can submit Tamil Nadu Co-operative Milk Producers’ Federation Ltd via the online mode from their official website, omcaavinsfarecruitment.com. Interested candidates can apply online for AAVIN Senior Factory Assistant Vacancy 2018 until the last date, which is 16.07.2018. Applicants can download the official notification from the official website before requesting this job. 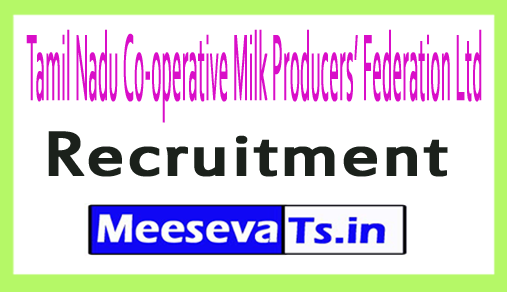 For more information on Tamilnadu Cooperative Milk Producers Federation Limited recruitment as claim details such as educational achievement, age limit, selection process, application fee and how to submit the application, key links, syllabus, tickets, results, previous documents are given below. Applicants with an overall grade of less than 40% will not be considered in the selection. Registration fee of Rs. 100 / - + 18% GST are paid by debit cards / credit cards and net banking from one of the banks of candidates from the OC / BC / BCM / MBC and DNC municipalities. Registration fee of Rs. 50 / - + 18% GST is paid by one of the banks of the SC / ST / SCA municipalities through debit cards / credit cards and netbanking from one of the banks. The application fee paid by the applicants will under no circumstances be refunded. Interested and eligible applicants may download the required form from the omcaavinsfarecruitment.com website and submit their application from 16.07.2018. The prescribed format should be sent along with the photocopy of all relevant documents to the address below. Look for "AAVIN Recruitment 2018 for Senior Assistant Contributions". Interested and eligible applicants can apply online from 16.07.2018 on the official website of omcaavinsfarecruitment.com. Participants must complete all details on the website form and upload copies of all relevant documents together with Photograph and press the submit button after confirming it. After successfully submitting the form, you can download / print it and save it as a reference. Registration fee Rs.100 for SC / ST candidates. Application fee Rs.250 for candidates BC / BCM / MBC / DNC / UR. Interested and Eligible applicants may download the required form from the aavinmilk.com website and submit their application form on 25.06.2018 or earlier. The prescribed format along with the photocopy of all relevant documents should be sent to the address below.